After Hurst Green couldn't conjure up the numbers to play the arranged fixture, Wonder-Chairman being ever the resourceful man he is found us a fixture against Four Elms CC, who have a brilliant clubhouse/bar ground combination. This 11th hour booking turned out to be one hell of a game. Captain O.Marsh lost the toss for the first time the season and had to lead his troops in to field on a scorcher of a day on a batting track, 35 over format. The scene was set and 12 knockers embraced the field, yes 12 (Brad, who kindly umpired until he was dramatically required). The Marsh Brothers opening attack for the first time ever for Knockers started in an interesting fashion. O.Marsh took the new nut first and proceeded to bowl 5 wides in the over off his full run up much to the amusement of many an onlooker. E.Marsh managed to seize back the initiative with his classic action full of lies and deceit which had the batsman always guessing lengths and pace. O.Marsh reassessed and came off a few paces and proceeded to create the most arousing noise any seam bowler would wish to hear as coming from over the wicket to the left-hander, the ball swung into the batsman and leather crashed into pole as the off-stump was sent back to the shadows. Two balls later the right-hander who replaced his fallen fellow looked to drive and snicked off to Ben 'The Brown Salmon' Ferrao at 2nd slip who reacted well to get a mitt to it but had to have Tim 'The Flying Silver Fox' Walker come to his aid with a full-stretch diving one handed pluck just in time and sent the Knockers wild. E.Marsh continued as O.Marsh took a spell after his two contrasting overs. Who else but Adam 'The Wobbly Athlete' Warburton who took a sensational Caught and Bowled with those buckets he calls hands. E.Marsh then had a sitter dropped by self-proclaimed 'Keeper-Batsman' Freddie 'Medicore' Mills after an inside edge. However Ed got his justice and clean bowled his man leaving nothing to the part-timer behind the sticks. 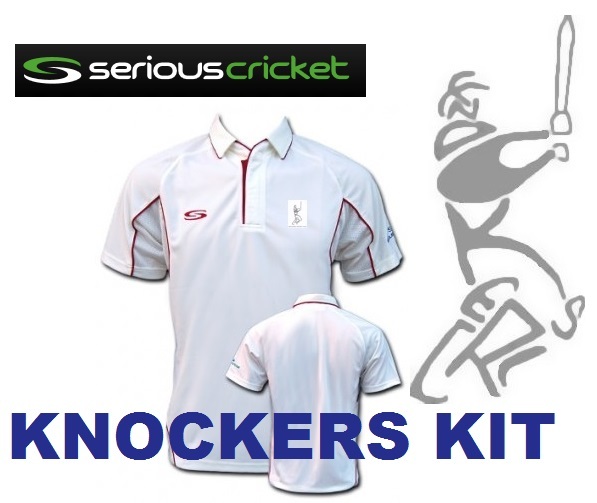 Knockers were now looking strong as 2 of Four Elms overseas had come and gone and they sat on 44-4 after 8 overs. E.Marsh got a bit too excited and tried to stop a boundary by sliding front on into the immovable (Coates will testify to that) sight screen and shredding his finger, rendering him umpire for the remainder of the match and bringing the delight of Brad 'Rocket Arm' Bergh into play. Enter Harry 'Daniel Vettori’, after 4 Back-to-Back All-Inclusives Coates who bowled a tidy first over going for just a single. Then when Phil 'Fake Tan' Hollows came on to join Coates the fireworks started as Four Elms decided to pick on the two spinners and hit one of Coates' offys into the basketball court going for the full court 3-pointer on the buzzer. Hollows ruined his previously tidy Knockers figures by posting 3-0-42-0 and Coates a respectable 4-1-19-0. The 'Jubilant Janners' took over seamers role, Keith 'The Keg' Barlow and B.Ferrao who had previously terrorised Eridge with consistent cannon fodder last season. The cursed downhill end continued to hurt the bowlers as after some suspect fielding Barlow was left with some undesirable figures but Ferrao weaselled one through first over to bring a much needed wicket as suddenly Four Elms were on 133-5. James 'Front Foot' Bramley like the apple and Tom 'Sexiest Thor' Youngs were both unlucky to not take wickets again due to some interesting fielding techniques. Finally the man who made two appearances in the Knockers AGM booklet after his batting and bowling at Eridge the previous season stepped up to finish off the sweltering innings. T.Walker who again picked up the key wicket getting the Four Elms bat who was on 105 caught by Barlow on the ropes. O.Marsh came back on to help Tim and despite Freddie's best efforts to prevent wickets picked up 2 more giving him 2nd spell figures of 4-0-9-2. Four Elms set Knockers 250 to get off their 35 overs. Tea was the best of the season with an incredible spread and the world cup on too. 'Wobbly' Warburton needed to catch a train early and so opened the batting alongside Brad, what unfolded then was only to be described as a Jason Roy inspired masterpiece. First ball to 'Wobbly' went straight back where it came from for a one bounce four over the dismayed bowlers head, the next ball was one of the purest strikes and it too followed the previous balls trajectory but sailed over for a maximum. 14 from the over eventually and Knockers were flying, Warburton on strike again and the first three balls go for 14 with a six hitting the school window next door, again a single to end the over. The pavilion was on its feet going mad, such clean hitting from the off, sadly a skewed single first ball and then 5 dots left the crowd longing for more... Bang, four more. Then going for a maximum over the longest boundary Warburton is caught by an absolute stunner and couldn't believe his eyes, overseas player Jackson covered ground from long on to deep mid-wicket and dived full stretch to take an absolute belter. Wobbly shrugged and got on his train happy. Walker and Ferrao were now at the crease after Brad smashed 18 but was again caught in the deep, and they looked in fine touch. Walker getting 29 with a six and 5 fours, but Ferrao pushed onto his first 50 for Knockers/since he was a teenager. Mills hit a silky 12 before he couldn't resist the floaty Walker who took three Knockers scalps before his day was over in similar fashion including the velvety Ferrao. This was after Barlow was caught on the edge of the field after a drive that defied the laws of physics like one of Beckham's best free kicks just balls before. Then Bramley strolled on the field like Liam Gallagher, not a care in the world and he'll do it his own way. Bram proceed to hit the same shot every ball he faced, a cross batted drive, which managed to never go in the same place twice. Effective though, as he nearly saw us home with a top knock scoring 54no. O.Marsh didn't trouble the scorers leaving a ball, Ashton Agar style, with arms high in the air as his off stump went flying. Coates and Bram put on a good show and a graceful T.Youngs looked in good shape before a risky 2 proved a little too greedy. Finally Hollows fell in the last over needing 20 off it and Knockers were 18 short. A great game which was full of twists and I think the fielding was the difference between the two teams in the end. Brilliant hosts and many a brew enjoyed after the game.